Around this time of year, skiing enthusiasts look to the sky for good news indicating that they can practice this snow sport. Enthusiasts from Madrid and Segovia are 70 and 30km from the Valdesquí ski station, which has been established as a point of reference for leisure in the Central System of mountains for over four decades. Between the Bola del Mundo, the Cerro de Valdemartin and Peñalara mountains, with a total of 27 slopes, a maximum height of 2,278 metres and minimum of 1,860 metres, Valdesquí has based its growth on meticulous respect for the environment, the buildings comprising the station being small, using materials consistent with the landscape. With this foundation it is no surprise that interior architect Javier Aníbal García has selected the solid surface from PORCELANOSA Group, KRION, in its variety which improves the quality of life of those nearby, KRION K-LIFE, with its KEAST technology. Javier Aníbal Studio has undertaken this project with K-LIFE not only due to its new purification properties, but also because of its qualities in wet spaces with the need for high resistance and durability, properties which have made KRION Solid Surface a point of reference in construction. 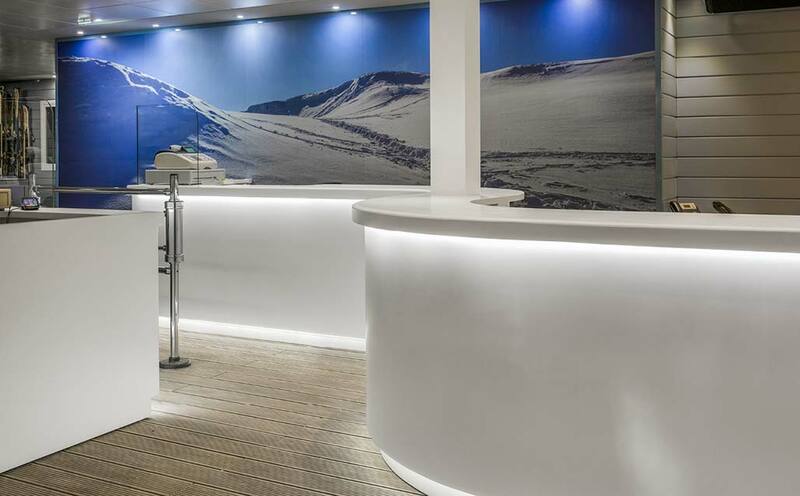 We can also find Starwood from Venis in some of the coverings of the ski equipment hire space, perfectly combined with KRION K-LIFE transformed by the company Carissa into curved countertops and client service areas, one containing a low relief which allows KRION K-LIFE to be backlit with the Valdesqui logo.